Proverbs 1:20-33 | Listening and speaking out – our opinions or wisdom’s voice? James 3:1-12 | Listening to God first – does He have our tongue? The theme for this Sunday is about who we listen to, and what is in our hearts as we speak. Proverbs 1:20-33 | Listening and speaking out – our opinions or wisdom’s choice? The voice of wisdom is like a woman whose advice (in that culture) could be ignored and even mocked, revealing arrogant obstinacy. Do we respond as learners or mockers? Peter and the disciples were put on the spot about who people thought Jesus was and who they said He was, but Peter’s declaration sealed their belief in Jesus as Messiah. This teaching from the apostle James stresses power of words for good or harm, and the importance of speech which comes from a heart submitted to God, not human opinions. The message this week is a reminder that the words we speak are like fruit, showing whether we are a thorny briar or a sweet variety. As disciples of Christ we guard against lapsing into the old, selfish nature, but rather show the Lordship of Jesus over our speech. “Wisdom calls aloud” – personified as a woman (the Hebrew word is feminine) who cries out, for all to hear in the marketplace, and at the place of business and debate, the city gate. 22 “How long will you who are simple love your simple ways? How long will mockers delight in mockery and fools hate knowledge? “Simple… mockers… fools” – Proverbs addresses three sets of people who need God’s wisdom and are progressively less receptive. Those who are simple or inexperienced, pethim, are the most open to God’s truth, Prov. 1:4. Fools, kesilim, have heard God’s wisdom but are resisting it. Mockers, latsonim, oppose wisdom with ridicule and are condemned in Proverbs as those too arrogant and contentious to learn. For further study on kesiyl, kesilim see Proverbs 17:10, 12, 16, 21, 24-25 and a related word in Prov. 17:7. 23 Repent at my rebuke! Then I will pour out my thoughts to you, I will make known to you my teachings. “Repent… then…” – the consequence of heeding the warning is a blessing, where wisdom is like a fountain of constant refreshment and, “I will make known”, though revelation. 26-27 …I in turn will laugh when disaster strikes you; I will mock when calamity overtakes you – when calamity overtakes you like a storm, when disaster sweeps over you like a whirlwind, when distress and trouble overwhelm you. “Laugh” – not heartlessly but at the predictability of those who spurn wisdom’s guidance and find themselves in difficulty as a consequence. 28-29 “Then they will call to me but I will not answer; they will look for me but will not find me, since they hated knowledge and did not choose to fear the Lord. “Call to me” – sounds like 1 Samuel 8:18, but this is probably not about prayer; wisdom is a personification, not God. The sense is that mockers and scoffers will frantically seek wisdom when they get into trouble, but ‘too little, too late’. 30-31 Since they would not accept my advice and spurned my rebuke, they will eat the fruit of their ways and be filled with the fruit of their schemes. “Eat the fruit… be filled with the fruit” – like the NT phrase “A man reaps what he sows”, Gal. 6:7. Evil people suffer the punishment of living out the consequences of their own actions, and will find themselves consuming the fruit of calamity, fear and destruction that they meted out to others. “Waywardness” – a play on the Hebrew word for turning which can mean positively “repent” or negatively “turn wayward”. Not heeding wisdom (being wayward) causes destruction; the remedy would have been to turn in repentance. “Whoever listens to me” – those who listen to wisdom’s voice experience security. IN PRACTICE The voice of wisdom is not the same as the voice of God, but closely aligned. It is more the sense of how we live out what we hear as the voice and truth of God. Wisdom is evident, or lacking, in all our attitudes of heart – and our heart determines what we say. Here we meet those who come across as uninstructed, or a stage worse, just stubbornly foolish and wrong-intentioned. But worst of all is the arrogant mocker, the opinionated “I know best” person who is proud that they have no need to listen and learn. This is the root of dissention, and derogatory slander, that is the devil’s strategy to impede the kingdom of God. To the extent that we allow it. QUESTION How proactive are you in seeking God’s wisdom to live by, day by day? Speaking as disciples of Jesus – who do we say He is? “Caesarea Philippi” – named after Herod the Great’s son Philip the Tetrarch, the recently-built town was on the slopes of Mount Hermon, a prominent landmark 25 miles to the north of Galilee. “He asked them” – for the first time, Jesus raises the question of His identity. He must clarify the nature of the Messiah as God’s servant who will suffer and be shamed for His people, a difficult concept (Peter’s response v.32 below) against the popular idea that the Messiah would be a military deliverer like King David. “Some say” – the disciples list some the most popular misconceptions. “But what about you?” – more emphatic in the Greek. Jesus compels a deeper response. “The Messiah” – or Christ. Both mean ‘anointed one’. A climax and the first time this is stated in Mark’s story apart from his introduction, Mark 1:1. Peter speaks out the conclusion of all the disciples. “Warned… not to tell” – the mission of Jesus as Messiah could not be understood apart from the ordeal of the Cross, which the disciples were not yet prepared for. To announce Jesus as Messiah would only reinforce the misunderstanding about the Messiah. The Jewish people, desperate to be released from Gentile Roman dominion, would try and make Jesus king by force, John 6:15 and see John 12:12-19. 31-32 He then began to teach them that the Son of Man must suffer many things and be rejected by the elders, the chief priests and the teachers of the law, and that He must be killed and after three days rise again. He spoke plainly about this, and Peter took Him aside and began to rebuke Him. “Peter… began to rebuke Him” – to Peter, what Jesus was teaching was not only unthinkable but just plain wrong. In this section, Mark 8:31-10:52 Jesus prepares the disciples for His inevitably, divinely-ordained death as they travel to Jerusalem. “Suffer… be rejected… be killed and…rise again”. The Messiah had to suffer, as predicted, Isaiah 52:13-53:12 and see Luke 24:44, and be rejected, which echoes Psalm 118:22, and die before being raised to life again, promised in Hosea 6:2. The Jews knew these scriptures but misunderstood them. Following the Suffering Servant passage, Isaiah sets out how God’s ways are higher than our ways, Isaiah 55:8-9. “He rebuked Peter” – with a seemingly harsh word, but Jesus recognised Peter coming under the same attempted deception that He had experienced in the desert confrontation with Satan, Matthew 4:8-10. 34 Then He called the crowd to Him along with His disciples and said: “Whoever wants to be My disciple must deny themselves and take up their cross and follow Me. “Take up their cross” – not a medieval-style religion of self-abasement which misses the point made in the sentences around this phrase. The disciple call is to die to the right to determine one’s own life path and success; as in being born anew, willingness to let go of the old life admits new life in Jesus – which will embrace the costs of shame and pain at times. 35 For whoever wants to save their life will lose it, but whoever loses their life for Me and for the gospel will save it. 36 What good is it for someone to gain the whole world, yet forfeit their soul? “Save their life” – self-preservation is a strong human instinct. We want to hold on to what we know and we believe represents security. To lose life in the flesh is to gain the spiritual life of the soul. Standing up for Jesus, His values and His words, requires courage in the face of ridicule – but it’s a non-negotiable position for those who choose to walk the Way of Jesus. IN PRACTICE Everyone wants to be known as a fan of a popular hero. Even if we have no local affiliation, we support a particular Premier football club ‘because it is the best’. People are intrigued by, and sometimes drawn to, ‘populist politicians’. Some “do a Huw’, the highly individual pose modelled by the revered Welsh newsreader. Jesus is more of a problem. In our church, He would be an outsider, a disrupter, someone bringing change. In our community, He doesn’t look like a figurehead as a servant of incomparable kindness. In a post-modern inclusive world, some want every spiritual insight to be a path to the truth. The question for us, as well as Peter, is who do WE say Jesus is? And that draws out from us where we really stand in relation to His Lordship of us. QUESTION How ready are we to stand up, be counted and speak for Jesus and His values in our sceptical world? James 3:1-12 | Listening to God before speaking – does He have our tongue? Not many of you should become teachers, my fellow believers, because you know that we who teach will be judged more strictly. “Become teachers” – the rabbi or teacher was honoured in Jewish and by extension, Christian society, Acts 2:42, Romans 12:7, 1 Cor 12:28, while Christians generally were regarded as social outsiders, James 2:6-7. James points out that few should aspire to a role which could influence for good or harm, and which therefore carried greater penalties in accountability, Matt. 5:19, Acts 20:26-27. “Fault in what they say” – the argument moves from the specific role of those called to teach, to the general responsibility we have for the words we utter, to bless and encourage or to harm. The main issue in the church, then as today, is the twin problem of dissention and slander, James 4:1, 3:9, 4:11. 3-5 When we put bits into the mouths of horses to make them obey us, we can turn the whole animal. Or take ships as an example. Although they are so large and are driven by strong winds, they are steered by a very small rudder wherever the pilot wants to go. Likewise, the tongue is a small part of the body, but it makes great boasts. Consider what a great forest is set on fire by a small spark. “Bits…rudder… spark” – the three images of small things that cause big effects were common in literature of the time. The tongue’s power to influence is way out of proportion to its size in relation to the rest of the body. “A world of evil” – like a little microcosm of the fallen world within us. “Set on fire by hell” – the cause of so many sins when taken over by the devil’s destructive influence. The tongue reveals the worldliness lurking in our hearts, Matt. 15:18. 7-8 All kinds of animals, birds, reptiles and sea creatures are being tamed and have been tamed by mankind, but no human being can tame the tongue. It is a restless evil, full of deadly poison. “All kinds of animals” – probably referring to Genesis 1:26. 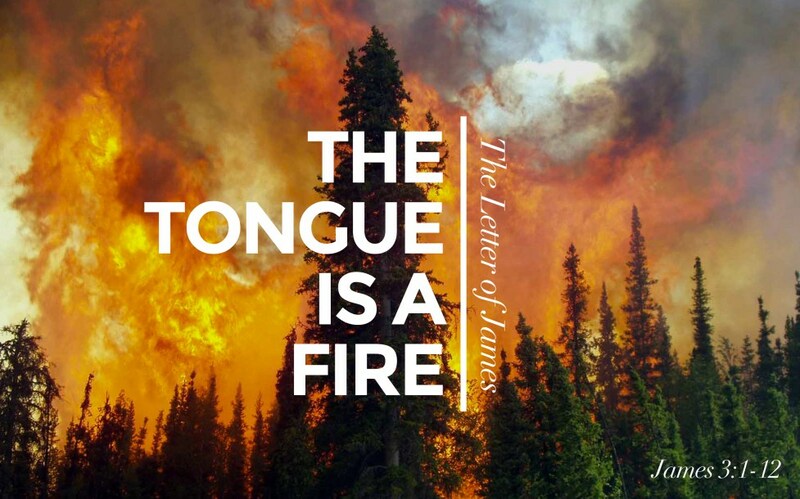 “No human being” – emphatic: the tongue often has a life of its own and can be like a deadly snake, Psalm 58:3-6, Psalm 14:3, which cannot be tamed except by God’s power working in us. 9-12 With the tongue we praise our Lord and Father, and with it we curse human beings, who have been made in God’s likeness. Out of the same mouth come praise and cursing. My brothers and sisters, this should not be. Can both fresh water and salt water flow from the same spring? My brothers and sisters, can a fig tree bear olives, or a grapevine bear figs? Neither can a salt spring produce fresh water. “We praise…and… we curse” – words have power, either to bless (bringing life and encouragement) or to curse (bringing harm and what is life-sapping). “God’s likeness” – all hearers have the worth of being created in God’s image. “Can both… flow from the same…” – it is incongruous for a Christian, reborn with a transformed heart, to utter demeaning words, like a tree producing the wrong fruit or a spring that runs brackish. Only a heart being continually renewed by the Holy Spirit can produce pure and life-giving speech. IN PRACTICE The school playground chant “Sticks and stones may break my bones but words will never hurt me” is good to help children refute name-calling but a poor representation of truth. Words that curse can have an enduringly hurtful effect. Who has carried the words of a parent or authority figure for whom we were never good enough? Prayer ministry later in life often reveals such barriers, words spoken over us that have had the effect of a curse, the word meaning the opposite of a blessing. On the other hand, the encouragement of the person who believed in us at a not-very-successful time is not forgotten. Words spoken have power, and there can be spiritual power behind the emotional or suggestive power as well. What comes from a resentful heart can do harm to us as much as the target. What comes from a pure heart submitted to Jesus can bring much benefit – perhaps, with faith, even a mountain-moving miracle. QUESTION What words have stayed with me as an enduring encouragement? And what words do I need to lift off my heart, to be free of their restriction? PRAYER From Psalm 139:23-24: “Search me, God, and know my heart…see if there is any offensive way in me…” And help me to speak with the tone and truth and compassion of Jesus, whatever is going on around me, and to be quick to forgive those who, like Peter in the Gospel reading, have spoken from the selfish nature and momentarily become a voice for the enemy of our souls.